FindLaw.com’s blog is reporting news today that a federal judge has preliminarily blocked enforcement of at least a portion of Arizona‘s controversial immigration law, known as the Support Our Law Enforcement and Safe Neighborhoods Act. Because the Arizona immigration law contained a “severability clause” – a clause that allows a provision of law that is of questionable legality to be severed from a larger statute or body of laws – U.S. District Court Judge Susan Bolton did not enjoin enforcement of the entire law. However, she did enjoin enforcement of the controversial portions of the statute until resolution of the U.S. Department of Justice‘s lawsuit against the State of Arizona is resolved. U.S. Const., Art. VI, Clause 2. (Emphasis added.) See also, Wikipedia article here. In reaching her conclusion, Judge Bolton determined that, in all likelihood, the U.S. would be successful in its lawsuit against the State of Arizona. This determination is a pre-requisite finding before a federal judge can enjoin the enforcement of a law. A copy of Judge Bolton’s order has been downloaded to the Box for viewing. 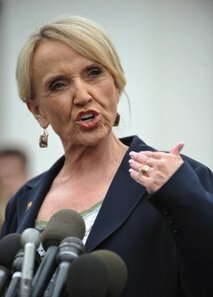 Arizona Governor Jan Brewer said Wednesday she would swiftly appeal a judge’s ruling blocking key parts of a new state immigration law, vowing to take it all the way to the Supreme Court. You can read the Arizona Governor’s response here, courtesy of Yahoo.com. This entry was posted in immigration, International Law and tagged Arizona, immigration, Judge Bolton, Law, State of Arizona, United States, United States District Court, Wikipedia. Bookmark the permalink.